Use t-molding transition for joining 1/2" thick flooring to lesser gauge flooring. Manufactured by Mannington, this t-molding transition is ADA compliant. Made of a single molding, you will find this to be a smooth, slip resistant surface. These t-molding transitions are suitable for high traffic areas. The cerco edge t-molding transition is a snap to install. You will need to also purchase a track base to insert the t-molding in to. All t-molding transitions are sold in 12' sections which can then be cut to the exact size needed on site. 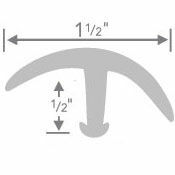 Order additional lengths if needed size is greater than 12'. All sections are shipped as a coil and should be unrolled and placed flat once received. Mannington t-molding transition strips are made of rubber and can be ordered in the popular shades of grays, browns, black, and blue. Color samples are shown at the bottom of this webpage. Computer screens may not always give you the true color due to individual computer settings. Call if you have questions regarding color. Choose color and number of 12' sections below. We'll take care of the rest. Order today.